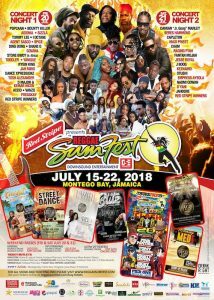 DownSound Entertainment, the organisers of Reggae Sumfest 2018 celebrated an incident free staging of the annual music festival. In a time of a public state of emergency, put in place to curtail the rising crime level in St. James, home of the festival, persons had questions about if it would affect the successful staging of the show. The festival promised patrons a more complete experience, with new events introduced Sumfest kicked off on the 15th of July 2018 with a beach party, followed by a packed week of events leading up to the main concert nights that patrons are accustomed to. Speaking in a recent interview DownSound boss Joe Bogdanovich commented on how succesful each of the lead up events have been, as they all exceeded expectations and targets and he pointed to the fact that they compromised of over 60 percent of tourists, with only thirty percent locals. The Wednesday event, Blitz — an all-black event, experienced somewhat of a small hiccup when Jamaican rapper Steflon Don, withdrew due to scheduling conflicts, however her replacement Jada Kingdom made sure the artiste was not missed greatly. On Thursday night there was a change of pace and tone as veterans of the industry were honored at the inaugural Reggae Sumfest Music Hall of Fame at the Sumfest Inspire awards, hosted at the Iberostar Hotel in St. James on Thursday. Among the inductees were Bob Andy, Chirs Blackwell, Copeland Forbes and renowed producer duo Sly and Robbie, who were not able to attend the event. 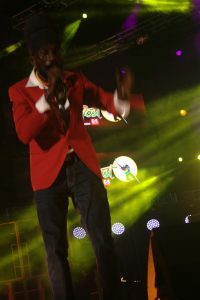 Additional awards were issued to Chronixx in the Reggae Sumfest Rising Star category; Beenie Man in the Sumfest Legend Awards, while The Golden Pen award went to journalist Pat Mechino and the Reggae Sumfest Big Up Award went to Hermine Shaw, who has consistently operated her food stall at the festival venue while special honours went to journalists Marlon Tingling, Winford Williams and Alan Lewin. Patrons at Concert Night One, better known as Dancehall night in previous editions, witnessed for the first time in the concert’s history, two upcoming artistes and three from Montego Bay, namely Teejay, Rygin King and Tommy Lee, were given the opportunity to hold the attention of patrons of the Catherine Hall Entertainment Centre until daybreak Saturday. It was, however, Rygin King who was found to be the strongest of the three, by earning numerous approvals as the predominantly young audience showed their approval for his set. The festival organisers payed great tribute to the city of Montego Bay by having there homegrown stars close off such a prominent night. Tee Jay earned his full share of accolades during his set, but Tommy Lee, though highly appreciated as the closing act, came at the end of a very long night — 11 hours of scorching dancehall performances. Dancehall artistes of this generation have sincerely improved their performance game over the years and are now capable of offering well thought-out sets, and as a result of this, weak performances are now few and far between, particularly with the major acts. Veteran deejay Bounty Killer, who has performed on 25 of the 26 editions of the Sumfest festival, delivered a mature set in which he called for an end to the social disorder or violence which has been plaguing the country, especially Montego By. The interjection of Wayne Marshall in his set, only served to heighten Rodney’s message, as he delivered his current hit Lord I Pray. With the appeal of the incarcerated deejay Vybz Kartel recently started, his name was on the lips of many a performer as they called for him to be released from prison. 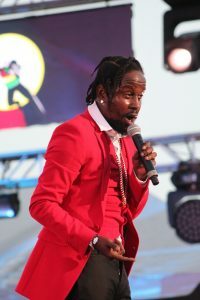 Former protégé Popcaan, who was among the night’s best performers, as he had his supporters in a hysterical manner as he dropped his new and old hits including We Pray with Dre Island. 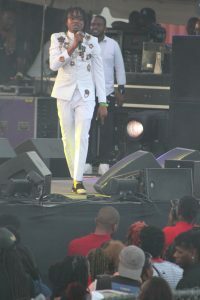 Other acts, such as Aidonia, shared the ‘Free Kartel’ sentiment amidst a very strong showing. Aidonia’s stable mate Govanna was another “Hot Topic”, making all the right moves to the delight of the audience. Lone major female deejay on the festival, Spice, almost wreeked usual havoc with an energetic, and raunchy set, which gave another of her signature entrances, this time in tribute to the cinematic blockbuster Black Panther. She dressed in a costume as Lupita N’yongo’s character Nakia complete with the all-female army, the Dora Milaje. 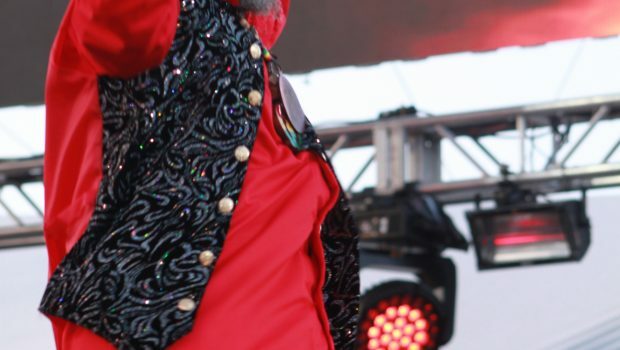 Other acts, including young turk Masicka, the perennial favourite Sizzla, dance master Ding Dong and his Ravers Clavers, Shane O, and African dancehall sensation Stoneybwoy all contributed to a strong showing on Friday night into Saturday morning.